Jeff For Banks: The Tax Man Cometh: Do You Pay "Your Fair Share"? In the midst of all the clamor in Washington over what is our "fair share" of paying taxes, I wondered how much my family contributed to the bureaucratic tax machine at the Federal, State, and local level. Yes, it's tax season again and this year I am determined to do my own taxes. But that decision didn't come without the requisite angst. Taxes are complicated, and I will be at the mercy of a piece of software to get it right. For the last decade I had a professional prepare my taxes in every year except one. The one I did myself: a day out of my life I'll never get back. But I received two "mail audits" the last two years, so this year I'm rolling the dice on my own again. Twenty-eight percent of what we earned paid some form of tax or another. What that doesn't include are the taxes paid by corporations that are passed on to us through the price of goods sold. 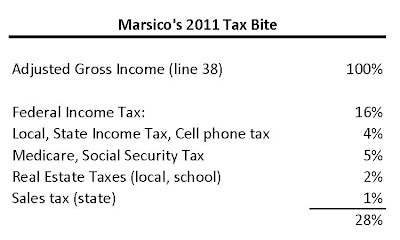 We would be foolish to think that we didn't pay for GE's tax through the cost of the light bulb. I'm not sure if this is high or not. But if you paid me nothing through mid-April, and remitted my entire paycheck to one government entity or the other, it would hurt... and be a depressing three and a half months. In that context, supporting our government programs does cause pain. 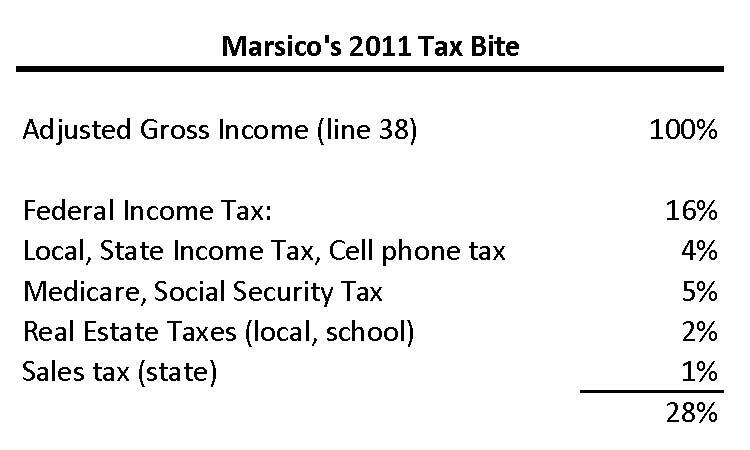 Tax dollars paid by the Marsico's eclipsed our mortgage by 5x. 5 TIMES! 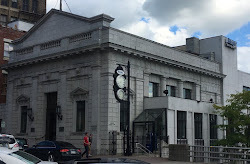 This is a banking blog, so I won't go on about taxes. But the thought that some people need to contribute more is baloney. And the complexity to understand exactly how much we owe and pay in taxes is equally baloney. Hey, I can vent. It's my blog.